I finished the first season of Daredevil. It took a few days before I started watching the series though. My feelings about Daredevil were a mixed bag. I enjoy the comic but the movie was such a horrible mess. I didn’t know what I would be getting from this third take on the character. 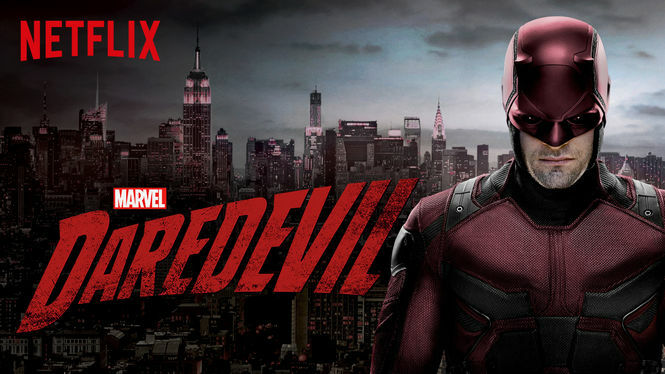 As the screen switched to the preview for some other Netflix Original series, I was overjoyed that I had watched Daredevil and stuck waiting for the next season. If you are unfamiliar with Daredevil, he is a street-level crime fighter from the Marvel universe. He is a lawyer by day. He was blinded by an accident in his youth. This accident robbed him of his sight but gave him extraordinary senses. Matt Murdock then used these new found gifts to help protect his area of New York, known as Hell’s Kitchen. One of the things that quickly got me hooked on this series is how they use the continuity from the movies in the show. Hell’s Kitchen, we learn, was hard hit by the battle of New York from the first Avenger’s movie. This area is currently under extensive repair with shadowy organizations circling the remains for some reason. This connection is woven throughout the show. In particular, I like the flavor that it brings to the character of Ben Urich. Ben is an investigative reporter that handles the area. After an award winning piece on the Battle of New York, he has been slipping from the limelight as the various interests have begun concealing their activities in Hell’s Kitchen. Ben even has a framed front page headline of the article in his office. Another thing that brought this show to the next level for me was the treatment that it gave to the main villain. In comic books, the villain is someone that is easily painted in broad strokes and cliches. In this show, the villainous tropes are present but a more human character is presented to the audience. There are several episodes before Wilson Fisk ever appears on screen. He is a shadowy name that is best not spoken of. Once Fisk appears, we begin to see a whole person unfold before out eyes. In particular, I found the episode that gives the audience Fisk’s origin story both the best of the episodes and the most disturbing. This is saying a lot since there is the whole scene where Fisk beats a man’s head to a pulp with a car door. The scene in Fisk’s origin begins brilliantly. The audience is shown the daily routing that Fisk goes through to start his day. After dressing and getting accoutered, he checks his appearance in a full length mirror. The image staring back at him is that of teen-aged Fisk, covered in blood. It was shocking and made me want to know why this man saw himself this way. After this episode, it was so hard to look at Wilson Fisk and not hear “Keep kicking him!” in my head. The clincher for me though is how the show uses Wilson Fisk as a dark reflection of Matt Murdock. Both of these characters are rooted in Hell’s Kitchen. The lesson’s the learned and the environment in which they were learned did much to sculpt these two into what they are today. The series drops in little bits that show this connection with aplomb. The art gallery is one of these scenes that highlights these similarities of these two men. Wilson, meets Vanessa as she talks to him about a piece that is made up of shades of white. She asks him how it makes him feel, and his response, “Alone.” A few episodes later, Matt decides to go to the gallery to learn more about Fisk. Vanessa chooses to show him a piece that shares elements in common with the piece that Fisk bought, but in red. Her description of the piece, though dynamic, feels just as lonely as the Fisk’s response to his piece. When Fisk arrives at the gallery, Matt is given a glimpse into the life of this villain that he is fighting. Matt is faced with the prospect that this is not some monster that he has imagined, but a person that loves, and is loved in return. This realization is something that is not often shown in series like this. It was refreshing to see, and see it done so well on top of it all. Being a comic book show, I was surprised at how well done it is. The actors are all top notch and are turning in great performances. The fight scenes are well done and the stunts are handled skillfully. There are little flourishes laced throughout which show that they understand the story they are telling. My favorite is in how the show handle’s Matt’s father’s victory. Matt’s father is a boxer and his last fight he is paid to throw the fight. This is to be a momentous occasion. instead of this big production, we are given a verbal play-by-play of the fight as young Matt stares at the TV. The audience is shown the joy on Matt’s face as his father wins the fight, and then cuts to his father quickly entering into the locker room and start preparing to flee for his life. If you are a fan of Daredevil and have not started watching this show, you should get on it. There are tons of little Easter eggs that link back to the comic for the fan of the comic. None of which detract from the overall accessibility of the show to those with only a passing interest in the Marvel Universe. Daredevil tells the story of a superhero by making both the hero and the villain are people to whom one can relate. Instead of just broad melodrama, the audience is treated to well-round characters that make it harder for you to chose sides at times. Well worth your time!